Central location with panoramic views over the river and beyond. It had 3 bedrooms and 2 baths, which was awesome for our big family of 5. There was also free parking right underneath the building. The elevator was fairly roomy and was fast. Location was good - close to everything. Fiona was nice and gave us a good overview. The washer:dryer was the easiest to use so far. The staff were very helpful on arrival and when I emailed the company that owned the flat the staff quickly arrived to try and solve some of the problems ie new toilet seat, repair of the shower head and a replacement bed the next day. The flat was in a good location. Location, close to main town centre and the Clyde river. Great location on the River Clyde a short walk to the large shopping mall. Bus service is close including the hop on hop off tour bus. Can walk to other shops and restaurants. Cleanliness and layout of the apartment were wonderful. Furnishings were comfortable and the kitchen well appointed. Late checkin was easy and onsite staff very friendly and accommodating. The apartment was very spacious with good views. We good excellent service for picking up & dropping the keys. the lady there also helped us when we had some minor issues in the room. The rooms were very clean. Kitchen was well equipped. Bathrooms were excellent. Good communication. Met on arrival with keys. Good location, easy walk to centre town. Nice view over the Clyde. Location and the space. Walked everywhere while here. The balcony was nice as we had sunshine both days. The little comforts provided.....Orange juice tea coffee biscuits and milk. The convenience of having a fully functioning kitchen with washer dryer. Lock in a great price for Riverview Apartments – rated 8.6 by recent guests! Riverview Apartments This rating is a reflection of how the property compares to the industry standard when it comes to price, facilities and services available. It's based on a self-evaluation by the property. Use this rating to help choose your stay! 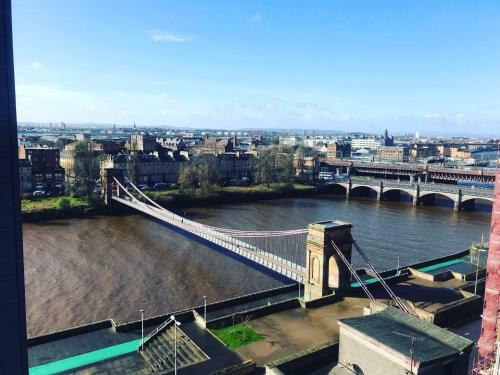 One of our top picks in Glasgow.Overlooking the River Clyde and 1,300 feet from Glasgow Central Train Station, this bright and modern apartment comes with free Wi-Fi, a kitchen and free parking. There is a plasma flat-screen TV, free Wi-Fi and a kitchen with a washing machine/dryer, a dishwasher and microwave. Riverview Apartment has stunning views over the city from floor-to-ceiling windows. St Enoch Shopping Center and St Enoch SPT Subway Station are a very short walk from the apartment. 뀐 Located in the real heart of Glasgow, this property has an excellent location score of 9.4! When would you like to stay at Riverview Apartments? This apartment offers a TV with a DVD player and a hairdryer. There is also a separate lounge area and a private kitchen. This apartment offers a TV with a DVD player and a hairdryer. There are 2 twin bedrooms and 1 double bedroom. 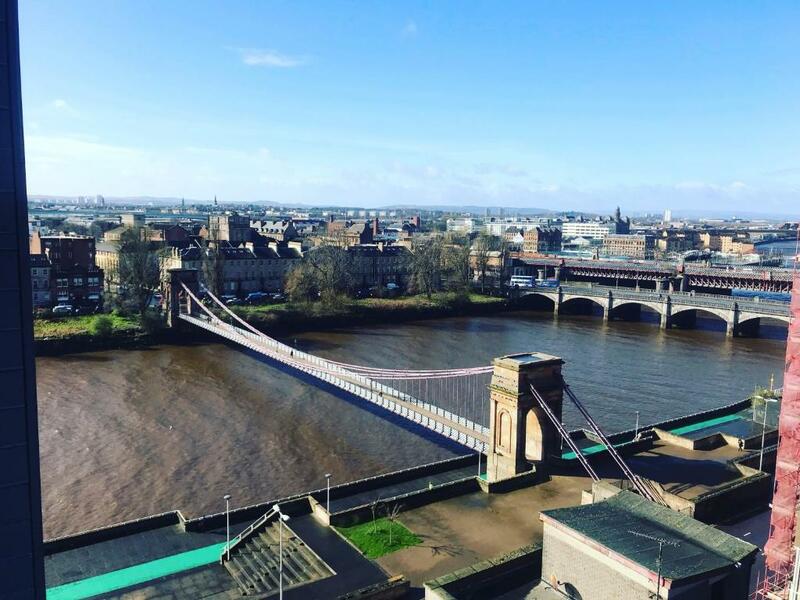 Great location near centre of Glasgow and overlooking the river. These apartments are ideally sitauated . House Rules Riverview Apartments takes special requests – add in the next step! Any additional older children or adults are charged GBP 25 per night for extra beds. Debit card Riverview Apartments accepts these cards and reserves the right to temporarily hold an amount prior to arrival. Riverview Apartments accepts these cards and reserves the right to temporarily hold an amount prior to arrival. After making a booking, guests will be contacted by the proprietor to confirm arrival and check-in times and access arrangements. The property reserves the right to ask for a deposit on arrival. Check-in between 19:00 and 22:00 is possible for an additional fee of GBP 40, subject to availability and by prior arrangement. Late check-in after 22:00 is possible for an additional fee of GBP 50, subject to availability and by prior arrangement. Please inform Riverview Apartments of your expected arrival time in advance. You can use the Special Requests box when booking, or contact the property directly using the contact details in your confirmation. Fiona was very apologetic and gave us wine and chocolates. She opened the other bedroom for our use. She agreed to us checking out at 12MD. We mainly enjoyed our stay apart from the irritations mentioned. The apartments are very central within walking distance of the shops and I am sure other attractions. We didn't really tour as we were there for a family gathering. Unfortunately the queen bed was broke. The slats are the ply type and definately not suited to a hotel considering how frequent it is used. Property in need of general overhaul - Curtain rail in main bedroom hanging off - blinds on window not working- toilet in main bathroom leaking . 3rd bedroom had only a broken rail to hang clothes on . The cutlery was poor quality, a couple of forks were sharp and bent. Great communication in the days before arrival, warm friendly greeting, fabulous location overlooking the river, central for arena/shops/restaurants. Welcome was excellent, location was fabulous, apartment spacious, clean and comfortable. And having milk and orange juice in the fridge and cereal was a lovely welcoming touch. Overall an excellent stay. Highly recommend and will be back.